(Reuters) - This is a story about a capricious cat named Harvey. Not just any wayward feline, mind you, but a Tabby who wandered 800 miles from Denver to Dallas, took a side trip into a 25-foot (7.6 m) pit and is actually going home after about nine months on the road. 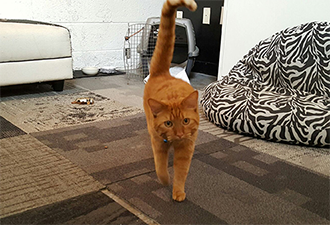 The 5-year-old orange cat, who went missing last June from his Colorado home, narrowly escaped being cemented into the hole when a utility worker spotted him and called Dallas Animal Services. Harvey's family was identified through a microchip under his skin. After a six-hour rescue, Harvey was caked in mud but uninjured, animal services spokeswoman Gabrielle Vannini said. How Harvey ended up in Dallas is anyone's guess and he's not saying. Vannini speculated that he may have hitched a ride or walked all the way to the affluent Highland Park neighborhood in central Dallas. "With that amount of time, it's not totally impossible he's just been roaming but given how far he was from home, it's likely he had some help getting down here," she said. Harvey's owner Jackie Ewer told TV broadcaster Denver7 that the Tabby has always been an outdoor cat and she was surprised he was found in Texas. "If any cat would have some crazy adventure, it would be Harvey. He's very funny," Ewer said.